Remember the ugly 2004 presidential campaign when the Bush camp accused challenger John Kerry of being a flip-flopper on a great many consequential political issues? Well, in his tireless efforts to advocate in favor of the Iran deal - perhaps the signature political and diplomatic achievement of Kerry's long career - the flip-flopper charge can once again be levied (and more accurately), this time regarding Kerry's personal consideration of Iran's right to a domestic uranium enrichment program, as affirmed under the Nuclear Nonproliferation Treaty (NPT). Defending the agreement reached in Vienna last month by the P5+1 (the five permanent, nuclear-armed members of the UN Security Council plus Germany) and Iran, U.S. Secretary of State trotted out a lot of conventional wisdom and long-discredited narratives about Iran's program and progress during a Reuters Newsmaker event Tuesday. The NPT is silent on the right to enrich. It doesn't grant people automatically a right to enrich. But the NPT also doesn't ban it. It doesn't say you can't enrich. And there are about 12 NPT countries, we among them, who enrich. At the moment we're not doing that, but others are. I think you have Brazil – there are a group of countries that use enrichment. The prohibited by omission is a dubious stance for the United States to take, especially when it has absolutely no problem with its own enrichment capabilities, let alone those of nations like, as Kerry noted, Brazil, but also Argentina, the Netherlands, Japan, Germany, all nuclear-armed permanent members of the UN Security Council, not to mention rogue states like Israel, India and Pakistan, which all developed nuclear enrichment and weapons programs outside the auspices of the NPT and monitoring of the IAEA. This has been the steadfast U.S. position for quite some time, and certainly throughout these most recent negotiations, as often articulated by Obama administration officials involved in the talks. Kerry himself said at a press conference in Abu Dhabi in November 2013, before the interim agreement was signed in Geneva, "There is no existing right to enrich for anybody. The NPT does not grant a right and it does not prohibit a right." Yet, Kerry and his State department gets the rights afforded by NPT, and international law at large, all wrong here. Not only is it a hypocritical stance, considering the historical record, but simply claiming that no language in the NPT specifically guarantees Iran the right to enrich uranium is also wholly disingenuous, as international law scholar, nonproliferation expert and law professor Dan Joyner has long pointed out. Neither uranium enrichment nor the stockpiling of fissionable material in connection with a peaceful program would violate Article II so long as these activities were safeguarded under Article III. Also clearly permitted would be the development, under safeguards, of plutonium fueled power reactors, including research on the properties of metallic plutonium, nor would Article II interfere with the development or use of fast breeder reactors under safeguards. However, most striking, as I've noted before, is perhaps Kerry's own devolution on this particular issue. 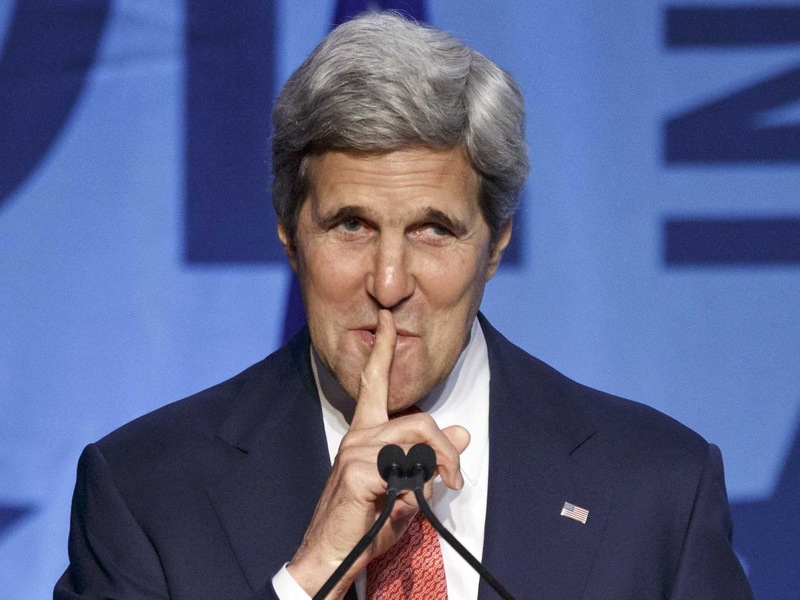 In a 2009 interview with the Financial Times, Kerry, then a Massachusetts Senator, stated that the demand that Iran have no enrichment capability is "ridiculous" and "unreasonable." His explanation was unequivocal: "They have a right to peaceful nuclear power and to enrichment in that purpose," Kerry said. To claim otherwise was "bombastic diplomacy." While these past few months Kerry has convincingly argued the Obama administration's case for Congress to approve the Iran deal this September, he still unfortunately relies on a great deal of false narratives to sell the agreement. His comments on Tuesday were no departure from this norm. For instance, Kerry claimed that U.S. government officials "have no doubt" that, prior to 2003, Iran was "chasing a nuclear weapon," despite there being no authenticated evidence to support this allegation. Not even the collective judgment of 16 American intelligence agencies, whose 2007 National Intelligence Estimate (NIE) Kerry is clearly referring to, makes that case. While the news media has long assumed that the 2007 NIE dispelled all doubt about the military nature of Iran's nuclear program before 2003, this is a wholesale misreading of the actual report. False claims and predictions about Iran's nuclear program and intentions go back decades, to at least 1984. Nevertheless, the key finding of the NIE, noted throughout the media as proof Iran had - then halted - a dedicated atomic bomb project, is this: "We assess with high confidence that until fall 2003, Iranian military entities were working under government direction to develop nuclear weapons." While sounding mighty authoritative, this finding is on less stable ground that it may seem, and not just because evidence for a pre-2003 nuclear weapons program is dubious and most likely completely fabricated. The "estimative language" used - and defined - by the U.S. intelligence community makes clear that even high confidence assessments are not to be confused with proof. The 2007 NIE itself notes that "phrases such as we judge, we assess, and we estimate" are meant "to convey analytical assessments and judgments. Such statements are not facts, proof, or knowledge." Indeed, the NIE adds, all "assessments and judgments are not intended to imply that we have 'proof' that shows something to be a fact." Beyond this, the term "high confidence" is also loaded. The NIE explains that it refers to a "solid judgment" based upon "high-quality information," but still hedges considerably: "A 'high confidence' judgment is not a fact or a certainty, however, and such judgments still carry a risk of being wrong." So, even for the most advanced, intrusive, and sophisticated intelligence apparatus on the planet, all that glitters ain't gold. The lack of real evidence is no secret, despite being seldom reported. After publicizing the 2007 NIE and its conclusions, then-IAEA chief Mohamed ElBaradei received a special briefing by U.S. intelligence. But, as ElBaradei recounts in "Age of Deception," his 2011 memoir, "They did not share the supposed evidence that had led them to confirm the existence of a past Iranian nuclear [weapons] program, other than to refer to the same unverified set of allegations about weaponization studies that had already been discussed with the Agency." Years earlier, ElBaradei had publicly questioned the authenticity of these "alleged studies" that Israel and the United States accused Iran of conducting. In a September 17, 2009 IAEA press release, ElBaradei noted that the agency "has no concrete proof that there is or has been a nuclear weapon programme in Iran." A few weeks later, in an interview with The Hindu, ElBaradei remarked, "The IAEA is not making any judgment at all whether Iran even had weaponisation studies before  because there is a major question of authenticity of the documents." None of this seems to matter in the mainstream debate over Iran and its nuclear program. During his Reuters Newsmaker interview, Kerry also said of Iran that, in 2003, "we found them red-handed with facilities they shouldn't have had and material they shouldn't have had, and of course, we blew the whistle on them as everybody knows with respect to the underground facility at Fordow [in 2009]." As I have documented before, claiming that Iran's enrichment plants at Natanz and Fordow, and the heavy-water reactor at Arak, were "facilities they shouldn't have" is utterly bogus. 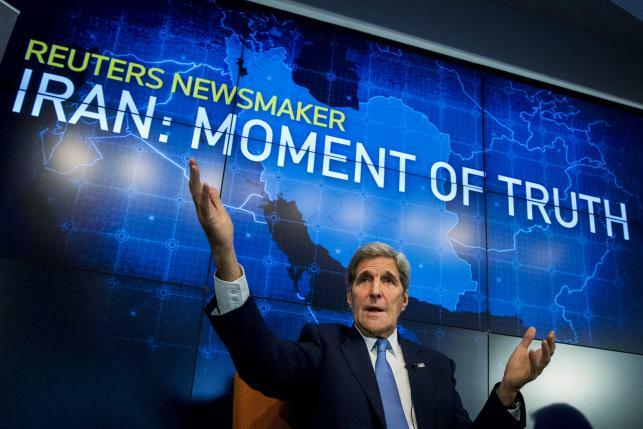 The Reuters chat with Kerry was entitled "Iran: The Moment of Truth." It's shame that even the deal's most staunch and passionate advocates are still peddling falsehoods about the history and legality of Iran's nuclear program and a threat that doesn't exist in order to make their case.